Frame | Multi-touch solution for spherical display. 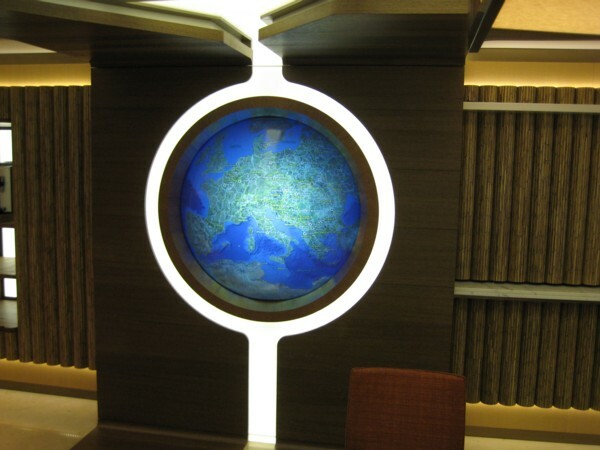 Globus (Erdkugel) is the multi-touch domed (sphere) screen. It was not possible to enlarge this design space, as cupboards are located on either side of the installation. Furthermore, the rear wall of the room cannot be used for mounting, as a ventilation shaft is located there. Easy access to projector and other devices within the housing is ensured. The entire installation is delivered as a cabinet, ready for installation. 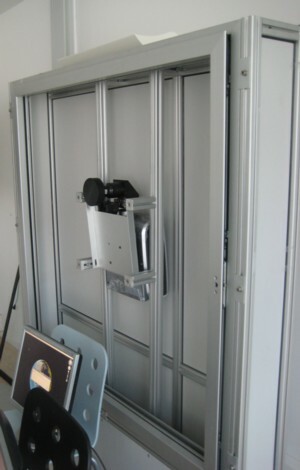 The cabinet is constructed so that no ambient dust and dirt can get inside of the cabinet. 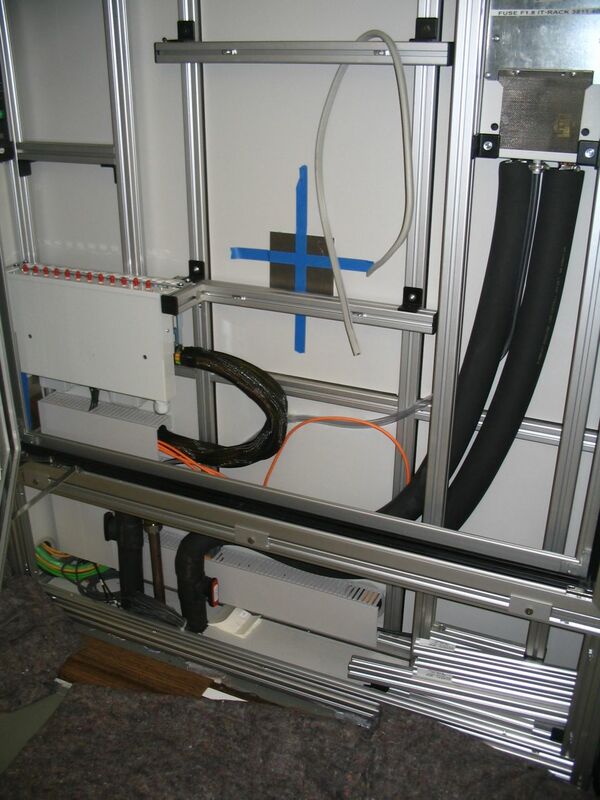 The cooling system is realized using a cold water supply to the cabinet. Cooling should be carried out using a TCW air conditioning unit located in the cabinet. Cooling units were included with up to 400 l / h flow volume in the design independent of the thermal load on the projector(s). In addition to the water connections, a condensate removal was provided by the customer, to which the cabinet must be connected. 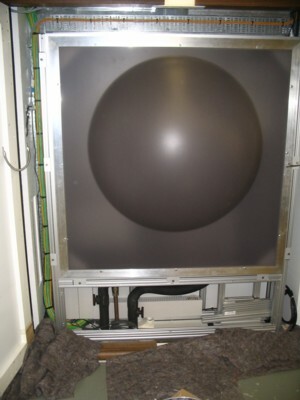 The system can be use on a ship, car or plain and is, therefore, prone to experience external vibrations. 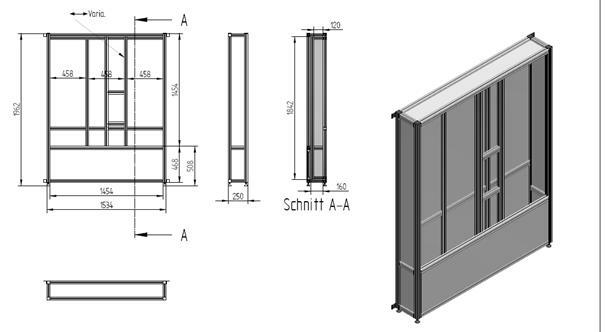 The cabinet is, therefore, constructed so that the entire function is decoupled from wall hull vibrations and other impacts in order to prevent the displacement of projector and multi-touch sensors.